Kerberos, an authentication protocol developed at MIT, requires entities (for example, a user and a network service) that need to communicate over an insecure network to prove their identity to one another so that secure authentication can take place. Kerberos functionality is included natively in a Windows Active Directory environment. Kerberos requires the use of a Key Distribution Center (KDC) to act as a trusted third party between these entities. All Kerberos server machines need a keytab file to authenticate to the Key Distribution Center (KDC). The keytab file is an encrypted, local, on-disk copy of the host's key. When using Kerberos authentication, the Active Directory server generates a Kerberos ticket that Novell Common Authentication Services Adapter (CASA) uses to authenticate the user, rather than using a username and password for authentication. IMPORTANT:If the Active Directory or Domain Services for Windows user source is configured to use only Kerberos authentication mechanism, ensure that the managed device is added to the user source domain. Generate a keytab file for that account. For more information, see the Microsoft TechNet Web site. Import the keytab file into ZENworks Control Center. In ZENworks Control Center, click the Configuration tab, click Infrastructure Management, then click User Source Settings. Click to browse to and select the keytab file. NOTE:Kerberos cannot be configured for Active Directory with multiple domains, since this would require multiple keytab files and ZENworks only supports a single keytab file. You can enable Kerberos authentication while adding a user source. For more information see Section 2.1, Adding User Sources. You can enable Kerberos authentication on an existing user source. In ZENworks Control Center, click the Configuration tab. In the User Sources panel, click the user source, then click Edit next to Authentication Mechanisms in the General section. Select the Kerberos check box, then click OK.
Windows login matches user source login? ZENworks also uses Username/Password authentication? Windows and ZENworks credentials match? Can log in to Management Zone? ZENworks login dialog box appears? For example, in the second row, the user’s initial login, user source, and ZENworks login credentials match. As a result, the user can log in to the ZENworks Management Zone and the ZENworks login dialog box does not appear. As another example, in the third row, the user’s initial login credentials are using credentials from a different domain and are different than the ZENworks login credentials. 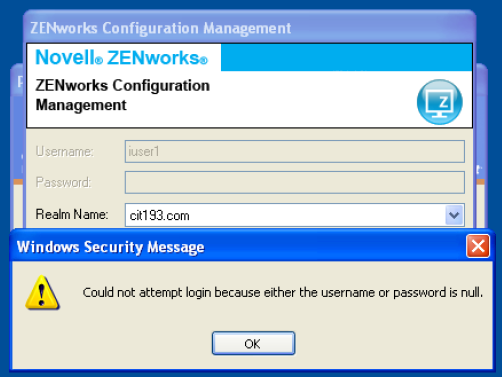 As a result, the user can log in to the ZENworks Management Zone, but the ZENworks login dialog box appears. This section provides information about the tasks that need to be performed on DSfW and ZENworks Servers to configure Kerberos authentication for ZENworks login. It also includes information about additional settings and workarounds that need to be performed on the DSfW Server to ensure smooth Kerberos authentication for all users. Ensure that the installation and configuration of the DSfW Server is done on the OES machine. For detailed information, see . Verify the functionality of the DSfW Server. For more information refer to TID 7001884 in the Technical Support Knowledgebase . For example, you can use the credentials provided below to configure the DSfW Server and Windows Workstation. Add the DSfW Server as the DNS Server. Select My Computer > Properties, then change the domain for the workstation to the DSfW server's domain. Provide the required credentials to add the workstation to the domain. Install Admin tools and Support tools on the client machine. These tools facilitate the DSfW Server management to create the keytab file. You can find the download details at . Install the ZENworks client on the same client by downloading the appropriate ZENworks client set-up from the http://<ZEN server>/zenworks-setup server. Create a user in DSfW server by using Microsoft Management Console (MMC), which can be associated to the DSfW service by creating a keytab file. In this case, the user for creating the keytab file is mcertuser. The expected result is as shown in figure below. To add a user source and choose Kerberos as the authentication mechanism, see . To verify the result, click the user source enabled with Kerberos. In Infrastructure Management, select Configuration > User Source Settings. Add the Kerberos keytab file. After the keytab file is you can view the details as shown in the figure. To verify the settings and to ensure the working of Kerberos authentication on the client machine, login to Windows as any user. For example, you can log in as either muser1 or muser2 created using MMC. The same login credentials are passed on to the ZENworks client and login happens seamlessly to the Windows workstation with the same user. The user used for creating the keytab file cannot login using ZENworks client as this user is associated with a Service Principal Name (SPN) rather than a User Principal Name (UPN). The UPN attribute is mandatory for a successful ZENworks Configuration Management and DSfW integration. The UPN attribute is created when the user is created by using the MMC. In case of ConsoleOne and iManager tools, the user created will not have the UPN attribute. While logging into ZENworks application (ZAPP) by using the ZENworks icon in the system tray, do not append the domain name (@xyz.com) with the username, if the UPN attribute is used. Issue: A user created by using iManager cannot login seamlessly using the ZENworks client. The login fails with the error message “Could not attempt login because either username or password is null” as shown in the figure. Possible Cause 1: The User Principal Name (UPN) attribute is not set for the users created using iManager. Select Directory Administration > Modify object. Also, set this attribute in the Others tab as shown in the figure. Possible Cause 2: The dnsDomainName attribute is not set at the root level in the DSfW domain. Workaround: Set the dnsDomainName attribute at the root level of the DSfW domain so that reflects at the user's level. Log in to iManager and select the domain root object. For example you can select cit193.com. Modify the object and add the Description field. 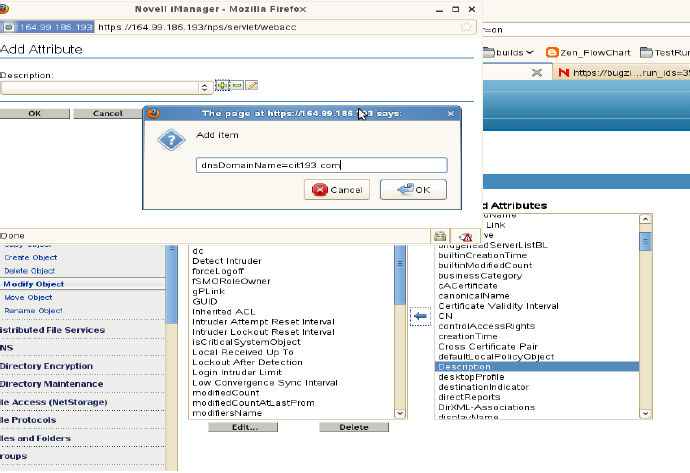 Restart the ndsd (Novell Directory) services on the DSfW server. The existing user once modified and any user objects that you create in future will automatically gets the UserPrincipalName attribute. For more information, see TID 7009221 from the Technical Support Knowledgebase . For setting the DNS domain name attribute, see. For verifying the functionality of the DSfW server, see. When using Shared Secret authentication, you must install and configure the Novell Identity Assurance Solution Client. For more information, and for a list of supported smart card readers and smart cards, see the Identity Assurance Solution Client documentation on the Documentation Web site. When a user uses a smart card to log in to eDirectory, the user is automatically logged in to ZENworks provided the schema of the eDirectory specified when the user source is added has been extended using novell-zenworks-configure tool. Logging in to a workstation with a smart card in the network disconnected mode by selecting the Computer Only Logon option and by using the NMAS for Windows logon method allows local workstation user to login, but the ZENworks user login fails. For more information on adding the user source, see Section 2.1, Adding User Sources. For more information on extending the eDirectory schema, see Extending the eDirectory Schema to enable Shared Secret Authentication. If the eDirectory schema is not extended, then Shared Secret is not available as an authentication mechanism. Consequently, a ZENworks login dialog box is displayed when the user on the managed device attempts to log in to eDirectory using a smart card. 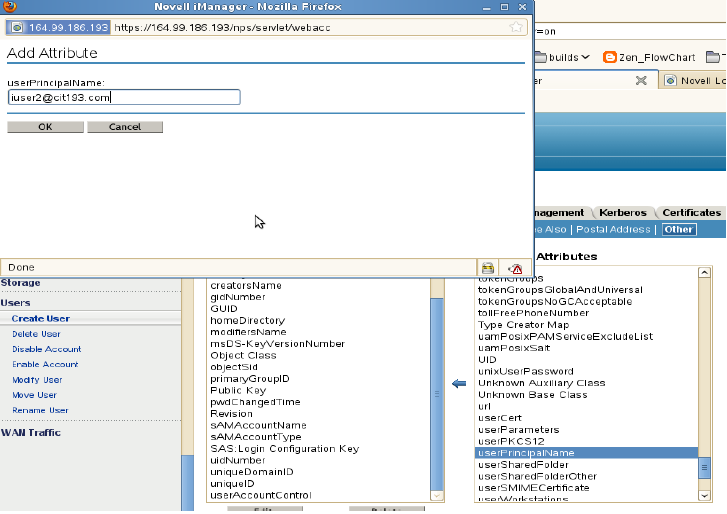 After the user specifies the eDirectory username and password, that password is stored in Novell SecretStore. The next time the user uses a smart card to log in to eDirectory, the password is retrieved from SecretStore and the user is logged in to the ZENworks without having to specify the password. To authenticate in to ZENworks by using Shared Secret authentication mechanism, the schema of the eDirectory specified when the user source is added must have been extended using novell-zenworks-configure tool. You are prompted to continue with the action of extending the Novell eDirectory schema and adding an optional zcmSharedSecret attribute to the user class. By default, 1 is selected. Press Enter. Enter the DNS name or IP address of the Novell eDirectory server to extend the schema. You are prompted to select Secure Socket Layer (SSL) or Clear Text communication for communicating with the eDirectory server. Enter 1 for SSL communication or 2 for Clear Text Communication, then press Enter again. Enter the port for communicating with the eDirectory server. The default port for SSL communication is 636 and for Clear Text communication is 389. Enter the fully distinguished name (FDN) of the Administrative User. Enter the password for the Administrative User specified in Step 6. (Optional) Enter the fully distinguished name for the ZENworks user source admin for whom the ACL would be applied. The ZENworks user source admin is configured as a user in the ZENworks user source configuration for reading users from the user source and need not be the Administrative User specified in Step 6. If you specify the fully distinguished name of this user, the program sets ACLs at the specified containers to provide read access to zcmSharedSecret attribute for this user. Enter the user containers for which you want to extend the schema. Multiple containers can be given separated by + sign. For example, o=sales or o=sales + o=marketing. Press Enter to generate random secret for all the users within the above containers. (Conditional) If you have chosen SSL communication for communicating with the eDirectory server, the server presents a certificate. Enter y to accept the certificate. When using Username/Password authentication with a Novell eDirectory, Microsoft Active Directory, or Domain Service for Windows user source, if the credentials the user specifies to log in to the workstation or to the domain match the ZENworks login credentials, the ZENworks login dialog box does not display and the user is authenticated to the ZENworks Management Zone. The username and password are also stored in Secret Store. If a user later logs in to ZENworks where no username or password is available (for example, the user logged in using a smart card), the stored credentials are used and the ZENworks login dialog box is bypassed. You can enable Username/Password authentication while adding a user source. For more information see Section 2.1, Adding User Sources. You can enable Username/Password authentication on an existing user source. In ZENworks Control Center, click the Configuration tab, click the user source, then click Edit next to Authentication Mechanisms in the General section. Select the Username/Password check box, then click OK.
ZENworks also uses Kerberos authentication? For example, in the first row, the user’s initial login, user source, and ZENworks login credentials match. As a result, the user can log in to the ZENworks Management Zone and the ZENworks login dialog box does not appear. As another example, in the second row, the user’s initial login credentials are using credentials from a different domain but match the ZENworks login credentials. As a result, the user can log in to the ZENworks Management Zone, and the ZENworks login dialog box does not appear.